The Guru preferred to call himself ‘servant of the Supreme being who has come to behold the wonderful drama of life’. To dissuade his followers from calling him God, or Son of God, he categorically stated ‘those who call me God, will fall into the deep pit of hell’. Like Advaita Vedanta, the Guru in his Japji Sahib states that ‘God has no marks, no colour, no caste, and no ancestors, no form, no complexion, no outline, no costume, and is indescribable. He is fearless, luminous and measureless in might. He is the King of kings, the Lord of the prophets. He is the sovereign of the universe, gods, men and demons’. In his talks the Guru synthesised the spirit of piri or sainthood, with miri, a soldier or householder’s life. He had natural talent for poetic composition. He used his poetic genius first as a means of revealing the divine principle and articulating his personal vision of the Supreme Being. Secondly, he used it to preach love and equality and a strictly ethical and moral code of conduct. Thirdly, he used the poetic method to infuse in the minds and hearts of his followers the spirit of fighting oppression in order to restore justice, peace, righteousness (Dharma) and to uplift the less privileged. In his first and only composition in Punjabi ‘Chandi di Var’, written in 1684, he depicted the legendary contest between gods and demons as described in the Markandeya Purana. He chose warlike themes for his compositions to infuse martial spirit among his followers to prepare them to stand up against injustice and tyranny. Guru Gobind Singh justified taking up the sword and waging just war to establish divine justice -- but only when all other means of reconciliation with the oppressor have failed. The sword was neither a symbol of aggression, nor was it a tool to be used for self-aggrandizement. ‘The sword’, he said, ‘was to be treated as the emblem of self-respect and was to be used only in self-defence, as a last resort’. In his Zafarnamah written in Persian, he recommended, ‘When all other means have failed, it is but lawful to take to the sword’. The Adi Granth compiled by his great-grandfather Guru Arjan Dev, was dictated by Guru Gobind Singh from his memory as the original was lost in war. 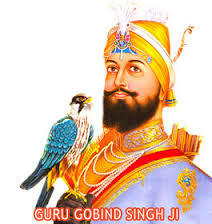 He included in it songs composed by his father, Guru Teg Bahadur. The creation of the Khalsa is the greatest accomplishment of the Guru. During the baptising ceremony, the Guru set a unique example of baptising himself by coming down on his knees like others. He laid down a strict social, moral, dietary and personal code of conduct for his followers. He said that the Khalsa should be a classless and ritual-free society in which there is gender parity. His teachings promote tolerance, justice and equality. (The writer is former professor of philosophy, Delhi University).